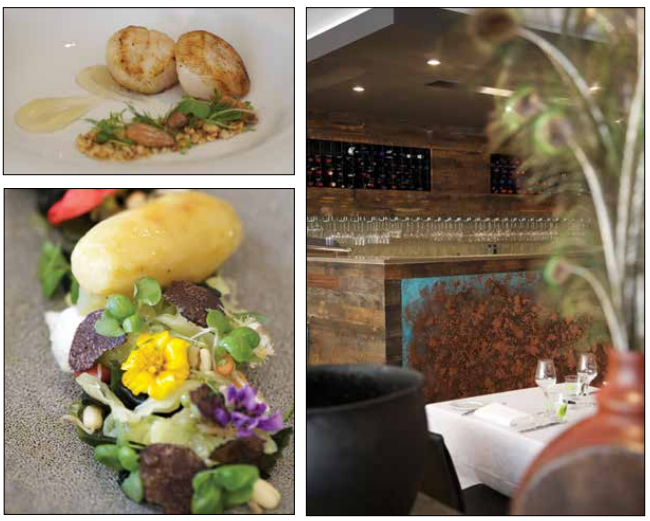 Try the seared scallops with almond crumble, Jerusalem artichoke and blue cheese veloute with a glass of 2011 Yeringberg Viognier – the spicy silky palate and fresh acidity of the wine providing the perfect foil for the explosion of flavours in the dish. Or dip fragrant, five spice roasted quail into a perfectly poached egg and toasted seeds with the voluptuous, Burgundian style 2011 Erath Estate Pinot Noir. Other stand-outs include melt-in-the mouth, slow cooked lamb belly with beetroot, black garlic, and rosemary and lavender jus – the black garlic adding an inspired twist. This dish has two suggested wines: Henschke 2010 Keyneton Estate Euphonium Shiraz Cabernet Merlot for perfectly balanced refinement or the Grant Burge 2011 Filsell Shiraz for those who like a traditional, meatier red. For dessert, the Poire William baba with pear and saffron ice-cream served with Yering Station Cold Pressed Pinot Gris is a beautifully presented and delicately flavoured ending to a memorable meal. Michelle Shaw is Kelvin’s partner, restaurant manager and according to Kelvin, “the boss”. Together their attention to detail is evident throughout – from the water glasses which echo the green tones of the Warrandyte aspect to the artful presentation of each dish.